Dr. Clarence J. Gamble was a pioneer in genetics research and the development of women’s sterilization techniques in the United States in the mid-twentieth century. One of the heirs to the Procter & Gamble company, which makes products like Tide laundry detergent, OralB toothbrushes, and FeBreze air fresheners, Dr. Gamble spent much of his life studying genetic disorders, “mental deficiency” among children, and the ways in which women could be prevented from giving birth and having children. He is known to have corresponded with Margaret Sanger, the champion of the contraceptive pill and a eugenics advocate (as is understood from the language she used in her “Plan for Peace”). From her letters to him in 1939, Dr. Gamble was supposedly against hiring black doctors at clinics. While Margaret Sanger’s plan for educating black communities about birth control options was to have black doctors be the ones to lead the effort, so as to not intimidate communities into making choices that weren’t exactly choices. Dr. Gamble held a much different view. He specifically argued that poor African Americans’ reproduction needed to be controlled to stop imbecilic children from taking over the population. “The mass of Negroes, particularly in the South, still breed carelessly and disastrously, with the result that the increase among Negroes, even more than among whites, is from that portion of the population least intelligent and fit, and least able to rear children properly.”* Presumably, white doctors would help African Americans to stop having “feeble-minded” children. Gamble continued to work with Margaret Sanger on spreading birth control well into the 1950s. Clarence J. Gamble was originally from Milton, Massachusetts. In 1937, Gamble developed a vaginal spermicidal foaming powder that appeared a promising form of contraception if it could pass clinical testing. In order to test his contraceptive, Gamble found a rural area of North Carolina that was willing to promote his powder in local public health centers. In the mountains of Watauga County, North Carolina, he later created birth control clinics with the aid of Nurse Frances L. Pratt. Though he blamed it on patients’ incorrect application of the product, Gamble’s spermicide powder was found to be ineffective at preventing pregnancy. Nevertheless, he persisted with contraceptive experiments in rural North Carolina and South Carolina. In the 1940s, he noticed that many potential draftees were turned away due to mental disability and began to wonder if genetic “deficiency” was at play. He initiated the studies of the mental faculties of school children that inspired professor of educational psychology Dr. Arthur M. Jordan in Orange County, North Carolina, and Winston-Salem mayor James G. Hanes, Sr. in Forsyth County, North Carolina, to launch their own investigations of the intelligence of school children. 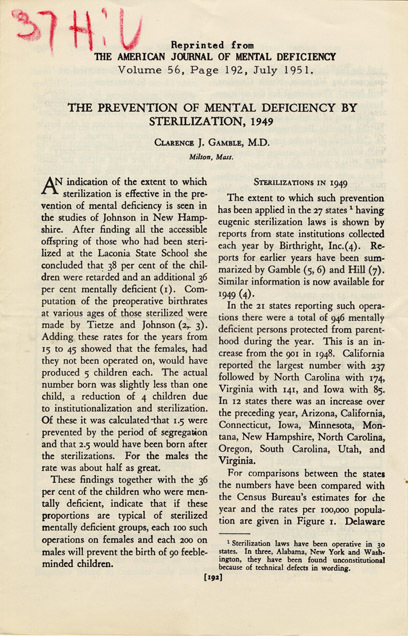 A paper written by Dr. Gamble on sterilizations. Gamble wasn’t the only one who pioneered eugenic sterilization in the United States; the work of people like Dr. Charles M. Goethe and Dr. Paul Popenoe in Southern California’s push for eugenic sterilization was closely studied by Nazi scientists. However, he was one of the doctors who traveled extensively in order to conduct and present research on women’s sterilization. In 1952, Dr. Clarence Gamble and his wife of Winston-Salem, North Carolina, both founding members of the Human Betterment League, attended the Third International Conference on Planned Parenthood in what was then Bombay, India. There, Dr. Gamble presented a paper in which he described a new way to tie a woman’s tubes “by means of the intrauterine cautery which, he claims, is an out-patient procedure requiring no anesthetic.”** According to a report on the proceedings, “practical demonstrations of the contraceptive techniques and the treatment of sterility were carried out on Indian women volunteers.”** It is impossible to know whether the women knew what they were volunteering for. According to the Human Betterment League’s board meeting minutes in 1954, Gamble conducted more studies about states where educational literature was distributed about sterilization and family planning and states that did not distribute such items. His research was sent along with letters of solicitation to various organizations and municipalities across North Carolina. He had found that North Carolina performed the most sterilizations of any state over a five year period. The Human Betterment League distributed brochures that Gamble had made in schools, and did as he suggested by reaching out to more organizations across the state to offer them brochures on their preferred method of birth control. By 1964, his involvement in the Human Betterment League of North Carolina had dwindled to an occasional letter sent to the board, but Gamble’s quest to control reproduction continued. Under the guise of protecting women’s reproductive health, Gamble and his wife were often abroad on trips researching contraceptive techniques employed by small communities in Japan, India, and other countries until his death in 1966. Board Meeting Minutes 1952-1954, in the Human Betterment League of North Carolina, Inc. Records #4519, Southern Historical Collection, The Wilson Library, University of North Carolina at Chapel Hill. *Gordon L. Woman’s Body, Woman’s Right: A Social History of Birth Control in America, rev. ed. New York: Penguin, 1990.